Massive blocks recut to form the walls of the Stone Lock on the Penshurst Canal may once have been part of Tonbridge Castle. The profitability of the Medway Navigation Company attracted the interest of speculators and in the 1820s an entrepreneur called James Christie, described as ‘an adventurer from Surrey’, paid an inflated sum of £20,000 for the main Tonbridge Water Mill and its water rights and with associates, set up the Penshurst Canal Company with the aim of extending the Navigation upstream to Penshurst. This was potentially very dangerous for the water reserves of the Medway Company who relied on the river flow to operate their locks and move their barges, and Christie could, in theory, control and manage the water flow. Legal proceedings followed and the Company obtained an injunction, at considerable cost, preventing Christie from interfering with their water. Christie reacted by diverting water through a new cut near the waterworks. There were fights between Christie's navvies and Medway Company workers and barges at the Town Wharf were sometimes stranded without water. The legal proceedings went on from 1829 to 1831 and Christie even tried to promote a Bill in Parliament to give him control over the Medway Company's affairs. However, Christie had stretched his finances too far and the Bill was thrown out. He went bankrupt and fled to America leaving liabilities of nearly £150,000, and the Penshurst Canal was never completed. Some results of Christie’s involvement though can still be seen today. The New Cut, dug in 1829, links two branches of the Medway on the west side of Tonbridge with the Racecourse Sportsground on one side and the River Walk on the other. The canal continues along the straightened and improved stretch of the river which runs parallel to Barden Road and then out to what is now Haysden Country Park. 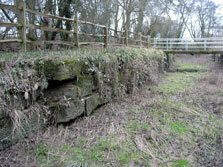 Remains of the ‘Straight Mile’ at Haysden which was dug in 1830 but never filled with water, can still be seen and the Stone Lock, built in 1829 at Haysden, remains largely intact. It was intended for transferring barges between the level of the Straight Mile and the higher level of the Medway. The track of the canal's Straight Mile can be seen in Google's aerial view of the Haysden area, though part has been obliterated by the bypass, flood defences and a former gravel pit. Walkers can explore part of the area with the help of Tonbridge Council's 'Haysden Country Park Historical Trail' – leaflet available here.